Harnessing the energy that opener Spirit Family Reunion stirred from the crowd, Trampled by Turtles filed on stage to the hum of a string quartet. The bluegrass rockers delved into the title track of their latest album, Wild Animals, their faces lit by downstage lights. The intimate campfire atmosphere erupted with a monk chorus of howls that matched the wolf on banjo player Dave Carroll's shirt. The reverend scene was quickly broken up by the sudden jump into "Come Back Home," which had the Phoenix floor shaking as a hearty collection of foot-stomping pounded the scared surface. Despite some early tech trouble, Trampled By Turtles settled into a comfortable groove, performing a diverse collection of songs taken predominantly from their last three albums. Their mastery of bluegrass instruments left the crowd in awe. Violinist Ryan Young was especially captivating, screeching and throttling the fiddle as if locked in a contest with the devil. After a hush of fingerpicked harmonics with mandolin player Erik Barry, Young rode a siren of electric string noise into hell on a finger-splintering melody during "Walt Whitman." 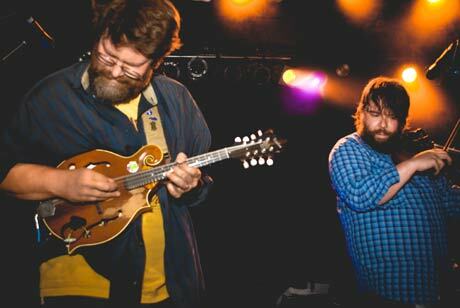 Trampled By Turtles are a bluegrass-country band with rock' n' roll blood in their veins. They are a group bridging the gap between traditional and modern with the advantage of being able to play at break-neck punk speed. "Lucy," a gently ambient song, allowed frontman Dave Simonett to show off his voice to an unusually quiet crowd, given the energy of the evening. "Wait So Long" halted the sentimentality; a mandolin battle between Young and Barry sent one crowd member surfing over a roots mosh pit as furious as any other. The show entered uncharted territory with the positively unholy sounds of "Gasoline." Set to a blue backdrop, the triangles of light carving out silhouettes into the stage, each instrument echoed unearthly sounds from the smoke and shadows. The thematic piece, performed in complete solemnity, was by far the biggest departure from the norm of the evening. The lengthy saga continued with chimes and screeches, to the delight of the crowd who, by the end, were transported to an entirely different place as it ended in a hail of bluegrass machine gun fire. The set was rounded off by the string quartet once again joining the group for "Midnight on the Interstate," and they left when the band ended with "Alone." Urged on by the demanding chant "Play more songs," the band returned to deliver a four-song encore. Anti-climatically, the audience was left craving crowd favourite "Codeine," and was left to express their piss and vinegar in the streets, satisfied but not entirely fulfilled.